POTSDAM, NY -- The Local Living Venture is working in cooperation with Hands On Health Holistic Healing in launching a Whole Health and Healing Academy for individuals interested in gaining a well rounded knowledge of holistic health issues. - which also means "eat yummy food! "The "academy" will commence in September, but this Spring they will jump start the sessions with 2 classes to pave the way for more sessions in the Fall. Attendees who successfully complete a certain number of sessions will receive a Certificate of Accomplishment for their personal resume and will take advantage of this opportunity to put health and healing into your hands. Employers are especially encouraged to send staff members, to reduce and eliminate health issues and insurance costs. Employers themselves are welcome as well; to enhance their health, providing leadership. Also welcome are health care workers who wish to learn more about prevention and self-responsibility in health and healing. "Whole Foods to Heal Everybody and Every Body Cell"
, located above the police station, behind the public library - park in the lot next to the fire station or street parking on Main St. The second in the series is entitled "White Sugar Blues"
and covers what sugar is, the forms of sugars, why it is so addicting, how sugar is damaging to body, how to truly kick sugar out of your life, and ways to add “sweetness” to your life without adding sugar. next to the public library.All classes in the ongoing series are 1-1/2 hours long and include a slide show that will also be emailed to all participants as well as various educational handouts. Follow up information will be tailored to also address the health needs of participants in the session. Contact 315-347-4223 orLocalLivingVenture@gmail.com for details and to register in advance (not required, but suggested - first come, first served.) All upcoming events may be viewed on the website at www.LocalLivingVenture.org by clicking through to the website for the Workshops / Events page. Instructor Paula Youmell, RN, MS, CHHC is a NYS licensed Registered Nurse, author & blogger, Certified Holistic Health, Nutrition & Fitness Counselor, Certified Herbalist, Reiki Master, NYS Licensed Health and Physical Education teacher, and Yoga teacher. Through her private practice, Hands On Health Holistic Healing in Potsdam, NY, Paula Youmell supports people on their path to whole health and healing and can be found on the web at www.HandsOnHealthHH.com. The Local Living Venture (LLV) coordinates near-weekly resourceful Living Skills Workshops promoting traditional rural and simple living skills as part of their vision for an even more capable community. 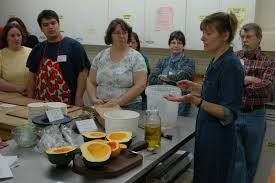 Listings of other upcoming workshops and events can be found on the Workshop Schedule page by clicking through to the current site at www.LocalLivingVenture.org.